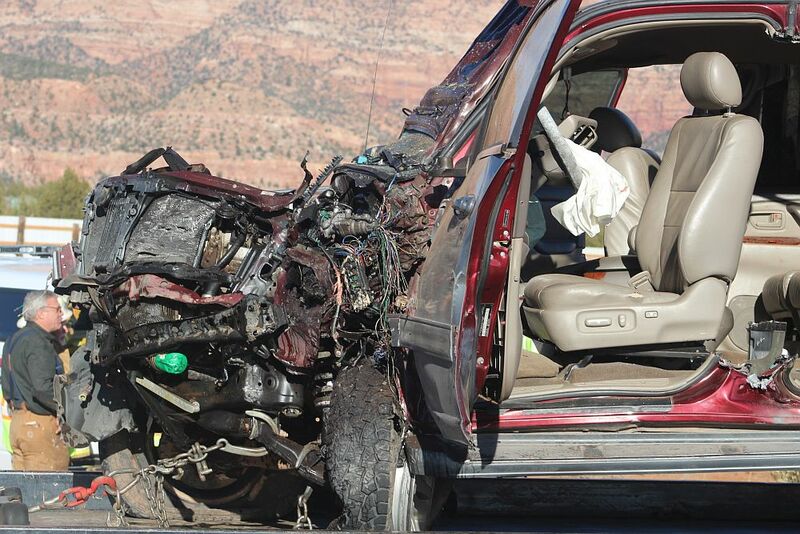 APPLE VALLEY – A head-on collision Friday afternoon in Apple Valley left eight people injured, two of them in critical condition. 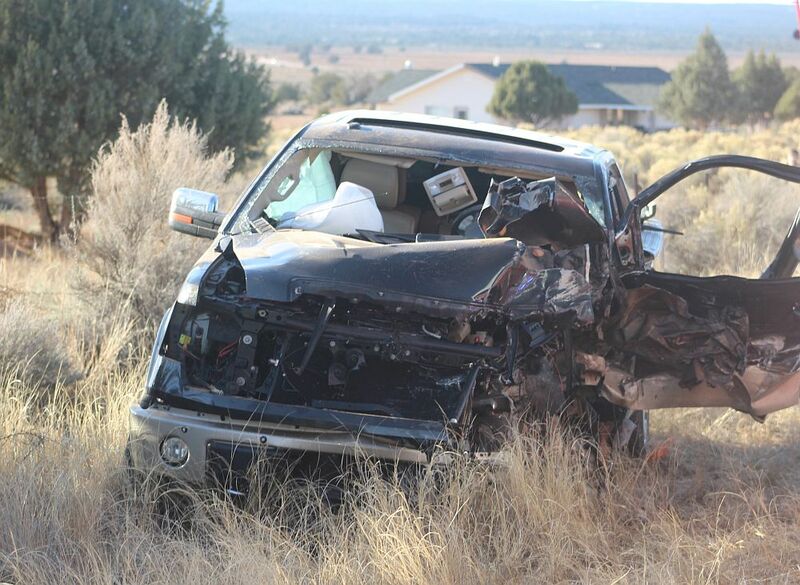 The accident happened a little before 2 p.m. near milepost 5 at the intersection of state Route 59 and 1600 East. 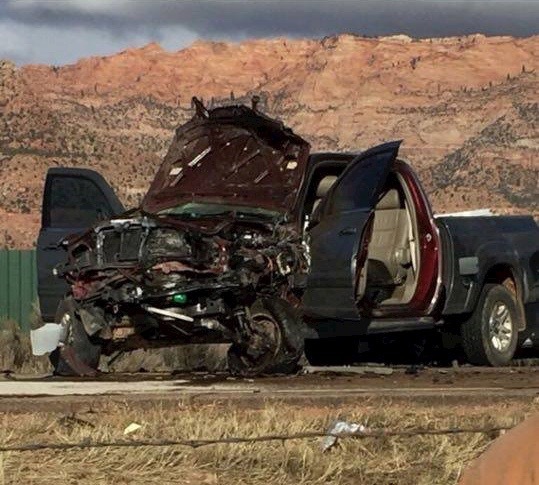 The accident occurred when a Toyota Tundra pickup truck came over a ridge too fast and didn’t see two stopped cars, Utah Highway Patrol Sgt. Danny Ferguson said. A westbound gray passenger car was stopped to make a left turn onto 1600 East, Ferguson said. 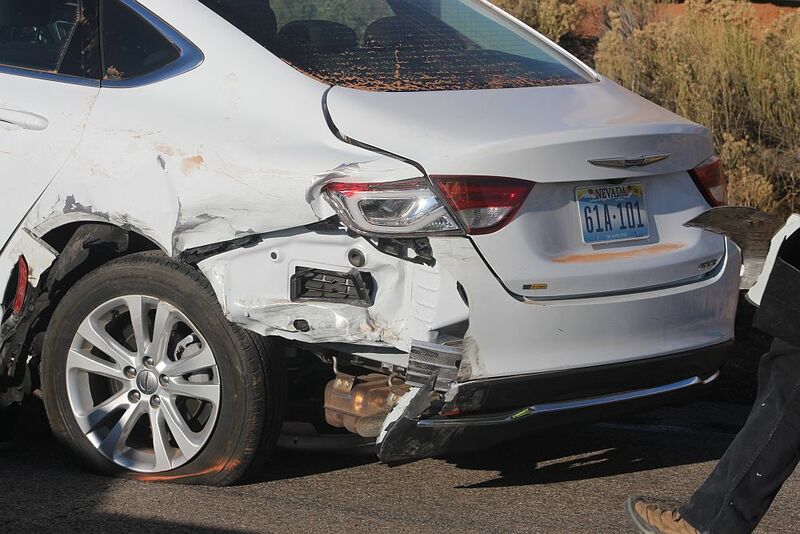 Two cars were stopped behind the turning car – a silver Toyota and a white Chrysler. 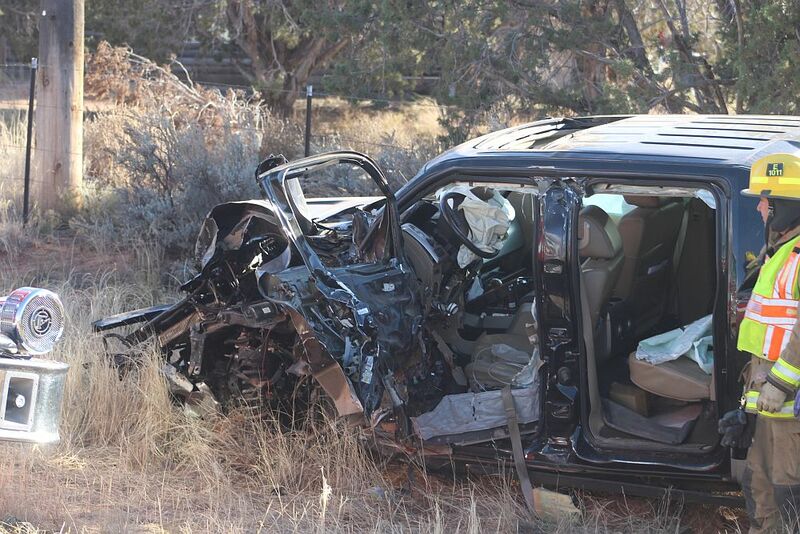 The gray passenger car made the left-turn safely. At that time, a red Toyota Tundra pickup truck westbound came up too fast behind the cars, Ferguson said. In trying to avoid a rear-end collision the Toyota Tundra clipped the white Chrysler in the left rear side as it turned out around the stopped cars into the eastbound lanes, and hit an eastbound Ford F-150 pickup truck almost head-on. The impact pushed the Toyota Tundra back into the westbound lanes striking the silver Toyota car. One of the occupants of the Toyota Tundra had to be transported by Life Flight helicopter to Dixie Regional Medical Center in St. George. Six ambulances were called out to transport the other seven people injured in the incident. Everyone in the white Chrysler was transported by ambulance, and the occupants of both trucks were transported by ambulance as well. Traffic was stopped in both directions for over an hour while the injured were removed and cleanup of the wreck took place. Ferguson was critical of bystanders looking on at the scene of the accident. Ferguson said he didn’t have a problem with the emergency responders being on scene. Ferguson said he got a little irate with some of the people doing those things — and he makes no apologies for it. “You don’t walk through an accident scene,” Ferguson said. So Officer Ferguson got a little irate at the scene … BUT, not enough to actually patrol the area. 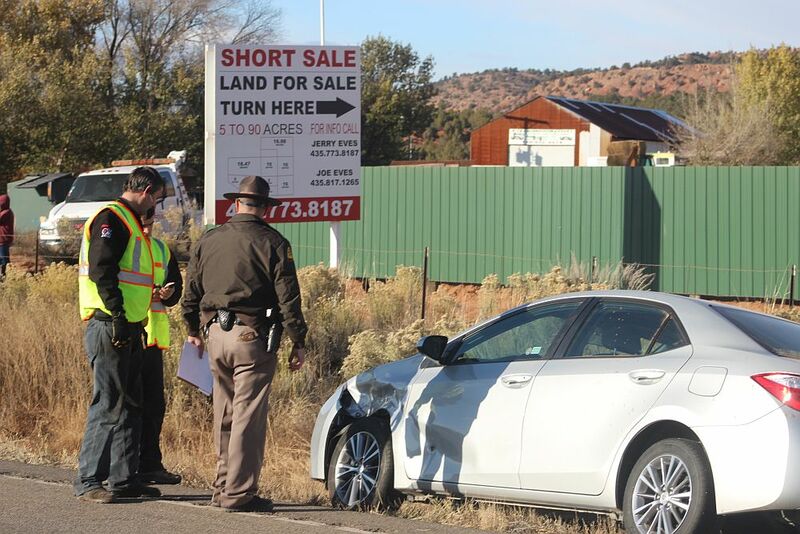 Utah Highway Patrol and Washington County Sheriff’s departments have been contacted many, many times by the residents and the Town of Apple Valley asking them to patrol and enforce the traffic rules on this stretch of 59. Washington County’s response is that they do not have the resources to routinely patrol the area due to their wide breadth of responsibilities — which is true. In contrast, the Utah HIGHWAY Patrol’s primary duty is TRAFFIC ENFORCEMENT and they refuse to patrol in that area. 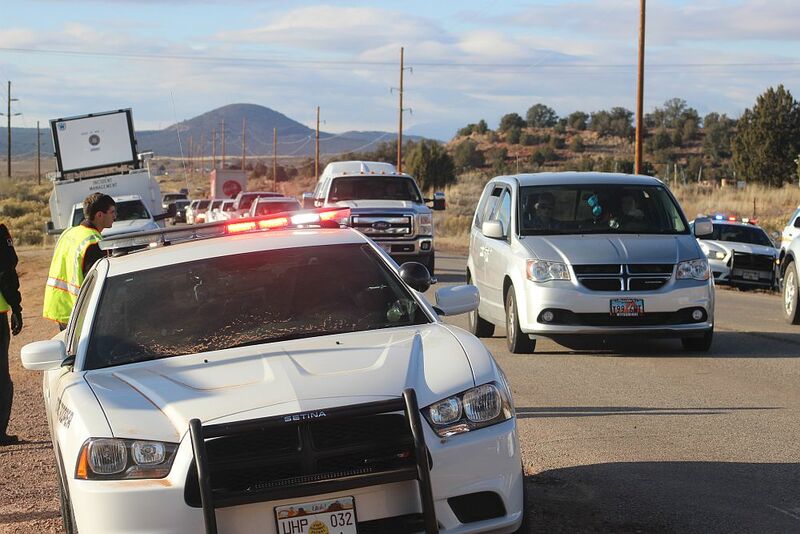 So the major offenders, who are traveling to and from Hildale and Colorado City, continue driving like maniacs — speeding 80+ and passing in no-passing zones — with no repercussions. The majority of those offenders do not hold valid Utah Drivers Licenses and their vehicles are not properly registered nor insured. A logical and appropriate action would be to begin conducting regular safety checks on Route 59 at Canaan (where the latest accident occurred). So, tell us Officer Ferguson and tell us Utah HIGHWAY Patrol how many bodies will it take to do your jobs? um.. i saw officers patrolling 59 all the time when i lived there. and i’ve only been gone 8 months. when i worked at chevron they came in to get a bite to eat.. maybe a small sheriffs substation is needed out there? might would do some good. just wondering if there are any names yet? bubbling well lane has precious peoples. wanna know they’re all ok. I hope everyone is okay. What a terrible accident. Perhaps the driver could have some of the burden of the responsibility of the accident, especially if he/she was familiar with that particular stretch of 59. You should always drive with caution. If you can’t see whats ahead of you on the road you should slow down not blunder ahead blind. If there is a problem with that part of the road the people should talk to their city council about it not Highway patrol. 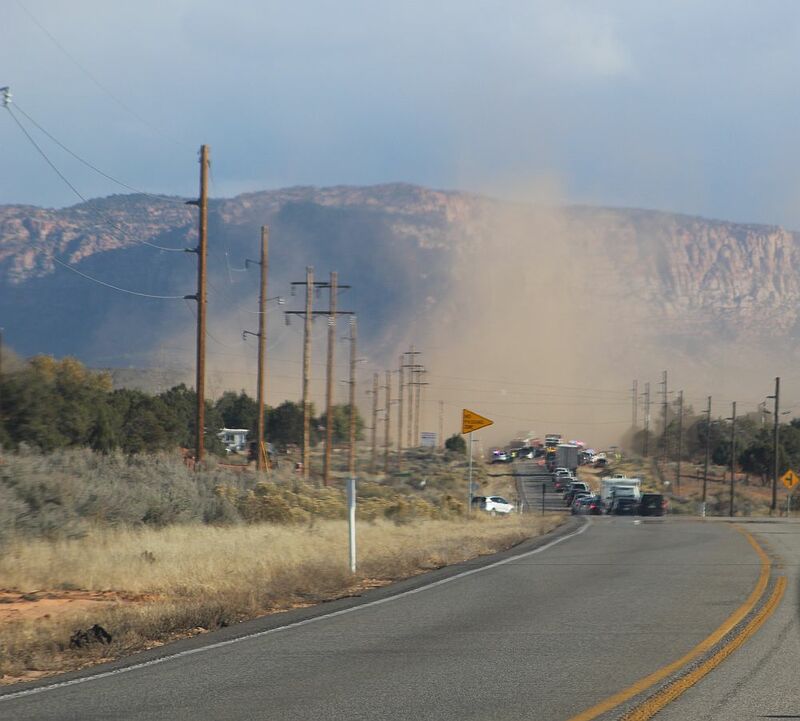 “I know most of them appeared like they were Hildale or Colorado City (people).” From what I’ve seen, they are the most dangerous drivers in this area. Maybe one of the problems is there is not a turning lane, have I blown anyone’s mind??? They actually pass at high speeds while people are using the turning lanes, along with passing in the no-passing zones. Entire lines of traffic have to slam on their brakes to avoid head-on collisions regularly and many are forced into the unpaved shoulders and ditches. I travel that road every day and everyday I am nearly run off the road everyday by “Pligs”. They do not give a crap about rules or laws. It does not apply to them. Also, the “Jeffs” cops are a worthless pack of plig bodyguards.